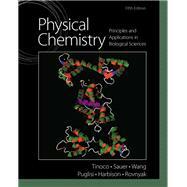 Introducing readers to the latest research applications, the new Fifth Edition of the bestselling Physical Chemistry: Principles and Applications in Biological Sciences with MasteringChemistry®puts the study of physical chemistry in context. Clear writing and the ideal level of mathematics combine for an engaging overview of the principles and applications of contemporary physical chemistry as used to solve problems in biology, biochemistry, and medicine. The addition of MasteringChemistry® to the program puts a host of effective study tools at readers' fingertips. Ignacio Tinoco was an undergraduate at the University of New Mexico, a graduate student at the University of Wisconsin, and a postdoctoral fellow at Yale. He then went to the University of California, Berkeley, where he has remained. His research interest has been on the structures of nucleic acids, particularly RNA. He was chairman of the Department of Energy committee that recommended in 1987 a major initiative to sequence the human genome. His present research is on unfolding single RNA molecules by force. Kenneth Sauer grew up in Cleveland, Ohio, and received his A.B. in chemistry from Oberlin College. Following his Ph.D. studies in gas-phase physical chemistry at Harvard, he spent three years teaching at the American University of Beirut, Lebanon. A postdoctoral opportunity to learn from Melvin Calvin about photosynthesis in plants led him to the University of California, Berkeley, where he has been since 1960. Teaching general chemistry and biophysical chemistry in the Chemistry Department has complemented research in the Physical Biosciences Division of the Lawrence Berkeley National Lab involving spectroscopic studies of photosynthetic light reactions and their role in water oxidation. His other activities include reading, renaissance and baroque choral music, canoeing, and exploring the Sierra Nevada with his family and friends. James C. Wang was on the faculty of the University of California, Berkeley, from 1966 to 1977. He then joined the faculty of Harvard University, where he is presently Mallinckrodt Professor of Biochemistry and Molecular Biology. His research focuses on DNA and enzymes that act on DNA, especially a class of enzymes known as DNA topoisomerases. He has taught courses in biophysical chemistry and molecular biology and has published over 200 research articles. He is a member of Academia Sinica, the American Academy of Arts and Sciences, and the U.S. National Academy of Sciences. Joseph Puglisi was born and raised in New Jersey. He received his B.A. in chemistry from The Johns Hopkins University in 1984 and his Ph.D. from the University of California, Berkeley, in 1989. He has studied and taught in Strasbourg, Boston, and Santa Cruz, and is currently professor of structural biology at Stanford University. His research interests are in the structure and mechanism of the ribosome and the use of NMR spectroscopy to study RNA structure. He has been a Dreyfus Scholar, Sloan Scholar, and Packard Fellow. Gerard Harbison was born in the United Kingdom and raised there and in Ireland. He received his B.A. in biochemistry from Trinity College, Dublin, and his Ph.D. in biophysics from Harvard University. After a brief postdoctoral sojourn at the Max-Planck Institute for Polymer Research in Mainz, Germany, he joined the faculty of Stony Brook University, and then moved to the University of Nebraska Lincoln. He is a Dreyfus Scholar, Lilly Foundation Teacher-Scholar and Presidential Young Investigator. His research interests are in nuclear magnetic resonance and electronic structure theory. David Rovnyak, a native of Charlottesville, Virginia, earned his B.S. in Chemistry at the University of Richmond and Ph.D. in physical chemistry from the Massachusetts Institute of Technology. After performing post-doctoral study at the Harvard Medical School under an NIH-NRSA fellowship, he joined Bucknell University where he has been recognized with the Bucknell Presidential Teaching Award for Excellence. His research focuses on new methods for NMR spectroscopy and physico-chemical behavior of bile acids.